Nicklas Bendtner is a Danish footballer who plays for Juventus on loan from Arsenal. Though he primarily plays centre forward, he has also played on the right side of attack for Arsenal. 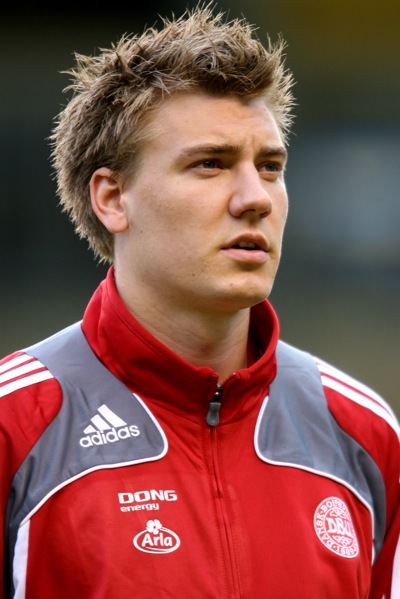 Bendtner played football for Tårnby Boldklub before joining F.C. Copenhagen's feeder club Kjøbenhavns Boldklub (KB) in 1998. He scored four goals in six Danish national youth team matches, before joining English club Arsenal in the summer of 2004. Bendtner's first team debut for Arsenal came on 25 October 2005, in a League Cup match against Sunderland at the Stadium of Light. Bendtner was loaned out to Championship team Birmingham City in August 2006 until January 2007. Bendtner made his debut for Birmingham, in the game against Colchester United on 5 August 2006, scoring the winning goal. Bendtner signed a new five-year contract with Arsenal in May 2007 and returned to the club for the 2007–08 Premier League season. His first Premier League start came at Everton on 29 December 2007 and Bendtner scored his first FA Cup goal against Burnley on 6 January 2008 as Arsenal won 2–0. On 3 April 2010, he scored the winning goal in a 1–0 victory over Wolverhampton Wanderers at home in the Premier League and also scored the only goal for Arsenal in a 4–1 defeat to FC Barcelona. The same month, he won the Arsenal Player of the Month award for his performances in March. On the last day of the August 2011 transfer window, Premier League club Sunderland completed a one-year loan deal for Bendtner. The following year, around the same time, Bendtner joined Serie A club Juventus on loan for the season, with an option to make the move permanent. Can Alexandre Lacazette provide the consistency that Arsenal have been missing? SK Adda: Who is the greatest footballer of all time and why?